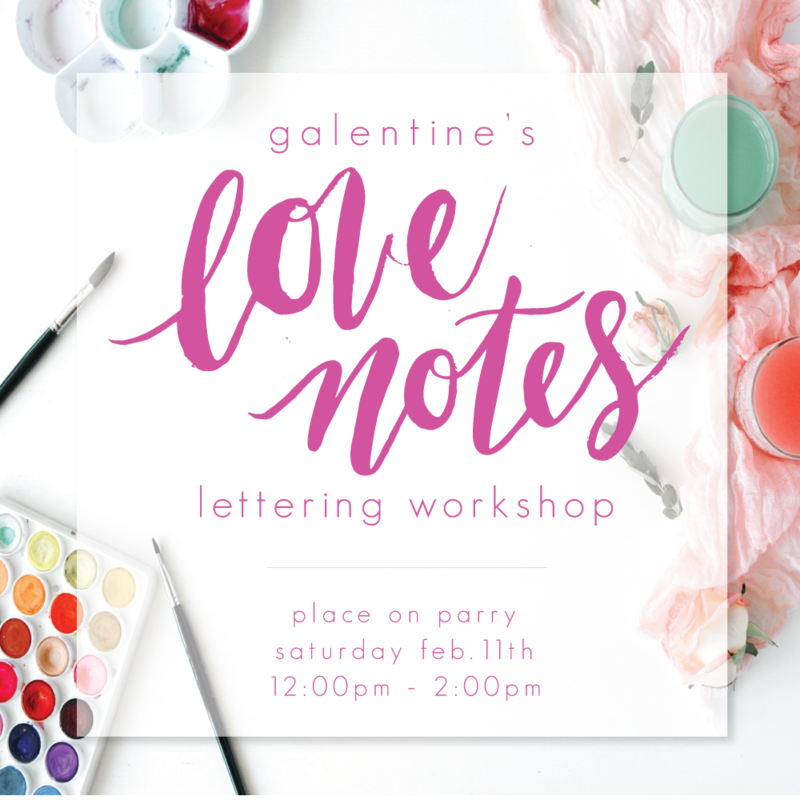 I am excited to announce a Galentine's Lettering Workshop: Love Notes! Gather your gal pals and sign up to learn the basics of brush lettering in this Galentine's-themed workshop taught by Chiara Marie Letters and hosted by Rhonda Jenkins (me!). Enjoy sips + sweets with your girl gang as you explore the world of hand lettering in our insta-worthy Galentine's space at Place on Parry. -create a custom Valentine's card for your gal pal, mom, or significant other-enjoy complimentary cocktails and sweet treats provided by local favorites! You are invited to arrive at 11:30am to mix and mingle with other lettering students before starting the workshop promptly at noon. You will receive two hours of instruction and hands-on experience from 12-2pm, complete with photobooth and professional photographer to showcase your Love Note masterpieces! You can learn more about your teacher, Chiara, at www.chiaramarie.comand on Instagram (@chiaramarieletters + @iamchiaramarie) where she showcases her love of lettering and her desire to inspire others through encouraging words and real life musings. *Limited spaces are available for this workshop, so purchase your tickets early via Eventbrite and be sure to invite your girl gang to join you! Tickets for this event are $75 at https://galentinesworkshop.eventbrite.com/ and are non-refundable.